First I would like to tell you few interesting things about the trends setting point of this semiconductor industry and electronics. According to a record that is found that the word "electronics" has first comes in 1894, Mainly in 1946 or before our early electronics computers use glass valves they called vacuumed tubes. What very interesting that the first electronics computer called INAC that have 18000 valves, that have a weight of 30 tons and takes the power required for the 10 homes. So amazing today's now we dont' take a computer having the weight of 30 tons, now you have the small computers in 1-2 kg only or may be less. Basically the early glass valves glows and produced heat to perform operations. So we have to use very effective cooling environment and ventilation system and the important thing is that when the system fails the debugging of these valves were very difficult. In 1947 a first transistor was developed in bell labs, don't worry I will show you a transistor after some time, Early Transistors are near about 40 to 45 dollars, and now the transistors are only 15 cents or less. In 1954 a fully Transistorised computer was developed and it was invented by IBM, and this take 2000 separate transistors. 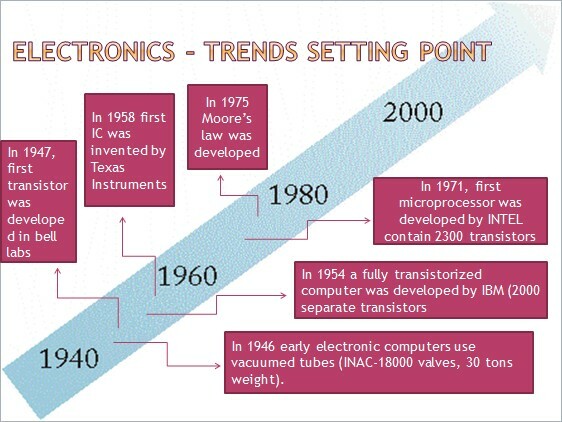 In 1958 the first integrated circuit normally called IC was invented at Texas Instruments. In 1971 the first microprocessor was invented by INTEL, this first microprocessor having 2300 integrated transistors, INTEL - you know about intel that is in intel inside logo, most of the computers and laptops in today life are working on INTEL processors. In 1975, this is the most important concept which was developed, and the concept was that the chip complexity i.e How much components or transistors implemented on a single chip, it was predicted that the chip complexity will be double in every 1 and half years, This concept is called Moore's Law in our industry, But His original prediction was in 1965, and He said that the number of transistors will be twice in each and every year. But in 1975 after 10 years of that prediction what they found that the chip complexity will be double in every 2 years. So our industry decided according to moore's law and result of last decade that the chip complexity will be twice in every one and half year (18 months), and till this day that is 2013 the moore's law continuously running in the industry. In the last point of that history in year 2011 the INTEL again introduced 10 core xion weasteren processor, This particular microprocessor has 2 billion 600 million transistors in a size of your finger point.